The campaign, which is running in several high profile spots, including takeover ads on popular media news site Mediaite, features a icy blue background with bold CNN red typography and focuses on the network’s talent both old and new. The graphical look is further enhanced by angular arrow shaped cutouts. Anderson Cooper occupies the first slot on the grid of talen photos, followed by Chris Cuomo, Jake Tapper and Kate Bolduan, all recent hires or, in the case of Bolduan, newly named host. 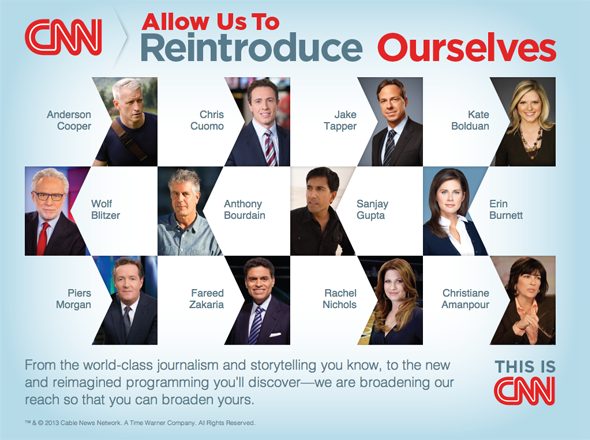 Other names include, Wolf Blitzer, Anthony Bourdain (another recent hire) Sanjay Gupta, Erin Burnett, Piers Morgan, Fareed Zakaria, Rachel Nichols and Christiane Amanpour. The campaign is an interesting move that shows a continuation of CNN’s efforts to develop personality centric programming, a formula rivals Fox News and MSNBC have found success with.